The upcoming Metro update to Microsoft’s Xbox, will start to be pushed down to your Xbox console some time this week, but alas it doesn't appear to contain the rumored Skype integration, which several rumors hinted at a Fall release. Well it's winter and the latest release doesn't appear to contain Skype integration with Xbox live. At least that is my assumption from reading the various news articles on the latest Xbox Dashboard, including Microsoft's official announcement, which make no mention of any Skype integration. Surely, someone would have uncovered this momentous piece of news if the latest Dashboard had it. Unless of course, Microsoft is pulling a Steve Jobs/Apple trick and keeping this thing under wraps. I'm skeptical though. I do think Skype integration is coming, but we'll have to wait a bit longer for that $8+ billion Microsoft paid for Skype to pay off. When you say “Xbox,” the Microsoft Kinect motion-sensor and voice communication system springs to live. Then you can say “Bing” to activate the Bing search function across the entire console and ask it to find anything related to the word “X-Men.” Bing will show you X-Men movie, TV or game selections. 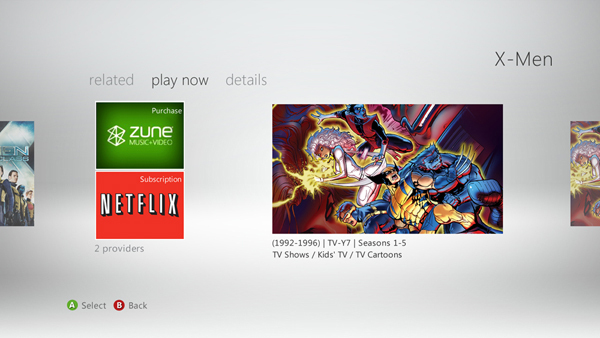 Then you can choose an option, such as Zune or Netflix, to view the selection. The Kinect system generally works better than it did with voice controls last year. The voice search is tied directly into Microsoft's Bing search and it limits the search to video/music/entertainment content filtering out the riff-Raff off the general Internet. Virtually nobody wants to read articles via their Xbox after all. The key thing is that you can use your voice to find music, games, game trailers, movies, TV shows, etc. The search results appear and then you can choose the lowest cost service to deliver that content. You can even use your voice to pause and rewind movies and TV show, though I would presume the accuracy of the Kinect microphone and speech recognition will diminish if you're playing loud music or other sounds. It would be cool if it the Xbox had an advanced echo cancellation algorithm that detected the media content sounds coming out of the Xbox and subtracted the waveform from the environment, allowing just your voice to be detect by Kinect's mic. In any event, this new update makes it easier to search and find new entertainment content, whether its from Microsoft’s own Zune music/video store or directly from the Internet using YouTube and other partner websites, which include BBC, CinemaNOW, UFC, HBO Go, and more. Even major TV players such as Verizon and Comcast have partnered with Microsoft to offer their content. You can get access to 26 TV channels from Verzon’s FiOS TV services as well as the complete library of 10,000 On Demand movies from Comcast. The update also allows Windows Phone users to control the Xbox remotely, which might give Microsoft's "reboot" of their mobile operating system a competitive edge over Android and iOS. The other huge feature is cloud-based gave saves. You get 1/2 gigabyte of free space to store your saved games in the cloud. Those of you that bought the less expensive Xbox slim console with no hard drive will be happy you pinched your pennies. You can save your game and resume it at your friend's house using the cloud-based storage. 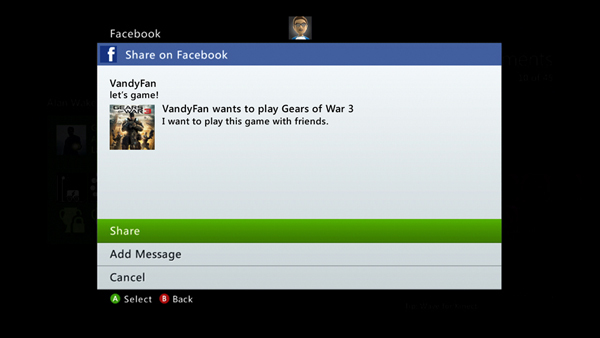 Just sign-in with your Xbox Live ID and away you go! Apple, Google, and Microsoft all have have TV devices – Apple TV, Google TV, and the Xbox. When discussing search results, the popular phrase is "Content is king!". Well, I have an addendum when it comes to premium (paid) entertainment content: "Premium entertainment content is profit!" It'll be interesting to see (of these 3) who wins the home entertainment horse race. Right now Google is king of search results content, Apple is king of mobile entertainment content (iPhone / iPad), and Microsoft is the king of home entertainment content. Each is attacking each others turf. I think the home entertainment battle will be the most interesting to watch.